The Bear Creek Greenway is a 20-mile, paved, multi-use trail that links the cities of Ashland, Talent, Phoenix, Medford and Central Point. The Greenway is continuous from the Ashland Dog Park to the Dean Creek Frontage Road near Seven Oaks Interchange on I-5, north of Central Point. The Greenway provides a separated route from cars, with only two at-grade road crossings. The trail parallels I-5, Highway 99, and Bear Creek, and provides Rogue Valley residents and visitors to the area a close-in spot for bird watching and wildlife viewing, as well as exercise and general recreation. Parks along the route provide parking, restrooms, and drinking water. For information about trail status and closures, please see the News section, call (541) 774-7799, or see the Bear Creek Greenway Facebook Page. Jackson County, along with the Cities of Ashland, Talent, Phoenix, Medford, and Central Point, collaborate to develop and manage the trail. The Bear Creek Greenway Foundation, a non-profit organization, promotes the trail and raises funds for new construction. The Greenway Map (below) illustrates mile markers, trail access points, roads that cross the trail, locations for parking and other public amenities. 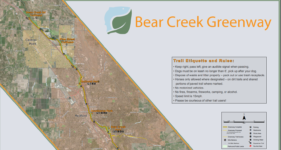 The Bear Creek Greenway Brochure has a more portable map and information about the trail. Paper copies are available at many local bike shops, chamber offices, and in brochure holders on the kiosks along the trail.